BEL Notification is out. BEL is recruiting for 150 Trade Apprentice Govt Job Posts. You can check BEL - Bharat Electronics Limited last date, download BEL notification, visit BEL official website and check other BEL Vacancy details.Complete Vacancy and recruitment Details about 150 Trade Apprentice Govt Job vacancies in BEL are provided below by JobSarkari.Com only for you. Last Date For Apply Online. 22/04/2019. Refrigeration & Air Conditioning. 04. Candidate Must Have Passed ITI under NCVT Scheme in Respective Trade With 60% Marks (50% For SC/ ST/ PH) in the Years 2016, 2017 and 2018. Age Limit as on 30/04/2019. Age Relaxation. 3 Years For OBC, 5 Years For SC/ ST/ PH. 5. After Save the Data System Will Generate the Apprenticeship Registration Number As Displayed on Screen. 6. After Apprenticeship Registration Candidate Have to Click on Establishment Form As Given on Our Website in Important Link Section. 7. Candidate Can Fill All the Details in Establishment Form And Make Your Registration No. Active Through Your E Mail Confirmation. 8. After That Candidate Have to Click on Apply Online Link And Fill All the Details As Given on Establishment Form. 9. Online Applications Can Be submitted on or Before 22nd April 2019. Q. 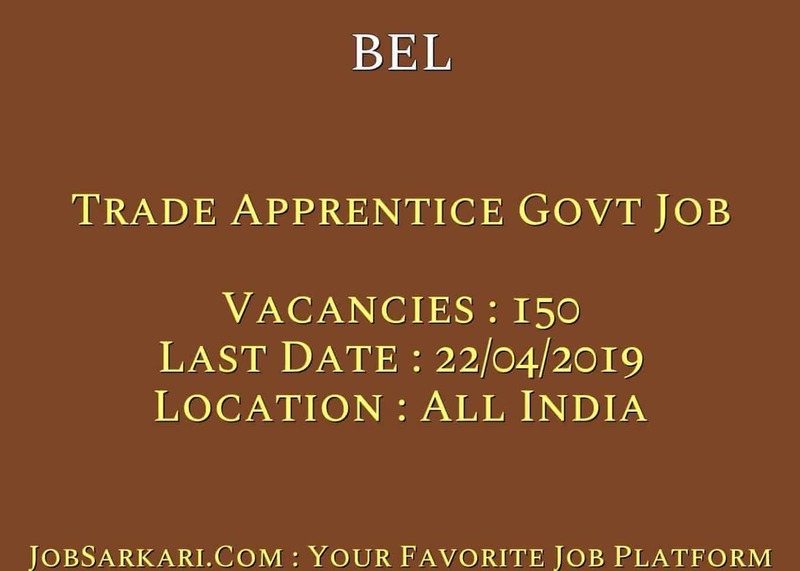 What is the Last Date For BEL Trade Apprentice Govt Job Vacancy ? A. 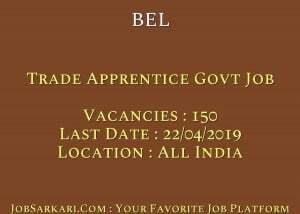 Last Date for BEL Trade Apprentice Govt Job Posts is 22/04/2019. Q. What is the Form Type of BEL Trade Apprentice Govt Job Recruitment ? A. The Form Type for BEL Trade Apprentice Govt Job Posts is Online. Q. How many vacancies are available in Bharat Electronics Limited Trade Apprentice Govt Job Posts ? A. There are about 200 Vacancies in Bharat Electronics Limited Trade Apprentice Govt Job Posts.